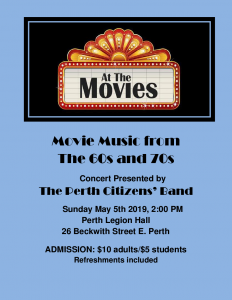 The Perth Citizens’ Band, Canada’s longest continuous town band, will be holding its annual spring concert titled “At The Movies”. The concert features a selection of movie music from the 60s and 70s. The concert will be held on Sunday May 5 starting at 2PM at the Perth Legion Hall, 26 Beckwith St. E., Perth. Admission at the door is $10 per person and $5 for students and includes light refreshments.